Brighton’s Best Restaurants awards were set up in 2016 to celebrate the city’s dynamic restaurant scene. We aim to bring national and local attention to the city’s new generation of independent restaurants and long-standing dining destinations, which rival any of the country’s première regional offerings. 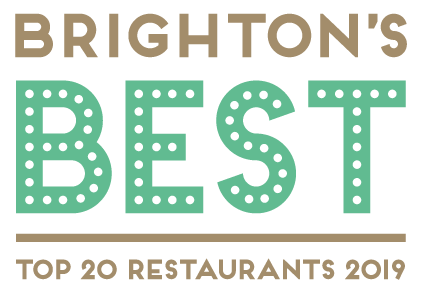 Voted for by local experts including food writers, chefs, restaurateurs, business leaders, critics and gourmands, all of whom boast an intimate knowledge of the Brighton and Hove food scene, the awards will celebrate the Top 20 restaurants* in the city. There are various other awards categories, which recognise the outstanding achievements of individuals (also voted for by the same panel of experts). These include Best Chef; Best Welcome; and Best Barkeep. Brighton’s Best Restaurants were co-founded by the Brightonian trio of Andy Lynes (food writer and author), Euan MacDonald (co-founder, 60 Second Reviews) and Patrick McGuigan (food writer), who share a passion for restaurants and their hometown. They were joined by Suzanne Lindfors (copywriter and freelance PR) in 2017. *Restaurants are defined as full-service establishments within the Brighton and Hove city limits that offer dinner at least part of the week. It could be a pub, pizza joint or fine dining restaurant, but not daytime cafés only open for breakfast and lunch, and no takeaways. Voters could not vote for a restaurant they own, invest in or work at. Listen to Andy, Euan and Pat talk about restaurants on their podcast restauRANT. Click here to listen. Euan is a founder of 60secondreviews. He has a dangerous addiction to the Kimchi Cheese Fries at Seven Stars, thinks Mange Tout is a well-kept secret, and loves The Salt Room for special occasions. Pat is a food journalist who writes for The Telegraph, Restaurant, Harrods Magazine and Shortlist, among others. He is a fan of the free children’s pizzas at Fatto a Mano, the natural wines at Plateau and the cheese slate at La Cave a Fromage. Andy is a freelance food drink and travel journalist and author. His work appears in the national and international press and is part of the 60Second restaurant review team. Brighton favourites include Bincho Yakitori, Polpo and Semolina. When she’s not posting photos of cocktails on Instagram, Suzanne dabbles in freelance PR, social media management and copywriting. You’ll mainly find her eating bao at The Pond or fighting friends for the last Korean chicken wing at Bincho Yakitori. copyright © 2019 Brighton's Best Restaurants.